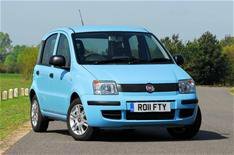 More power and more mpg for Fiat Panda | What Car? The Fiat Panda supermini now comes with a more powerful, more economical petrol engine. A 69bhp 1.2 unit replaces the current 1.1-litre engine. Average fuel economy is 1.1mpg better at 57.6mpg, while CO2 emissions fall from 119g/km in the 1.1-litre to 113g/km. Despite the economy gains, the Panda 1.2 is significantly faster and has a higher top speed. Prices increase slightly at 8445, the entry-level 1.2 Active will cost 485 more than the 1.1, although Fiat has a deal available at the moment, where the entry-level car costs just 6645, making it one of the cheapest new cars on sale. The 1.2 Mylife, which comes with alloy wheels and remote central locking, costs 9255 (introductory offer at 7245), while the 1.2 Dynamic is 9865.